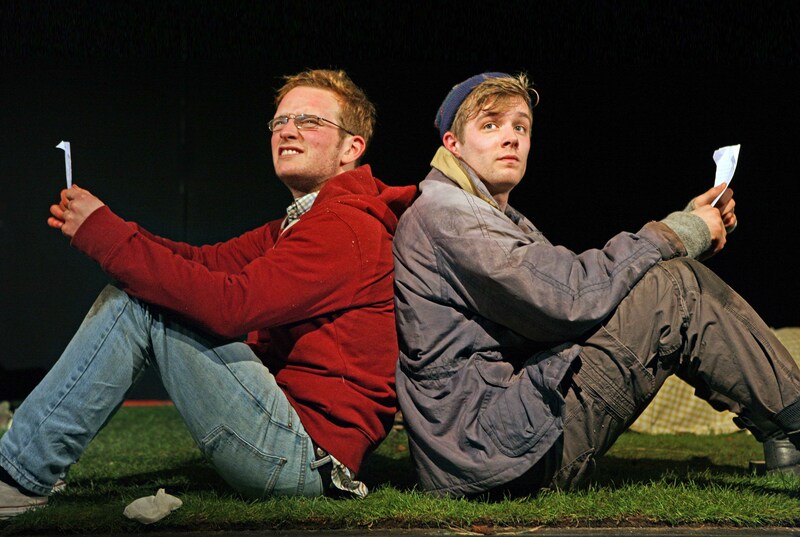 Milked | National Tour | Soho Theatre | Pentabus Theatre Co.
Adam Redmore & Oliver Mott in Milked. Photo by Richard Stanton. Simon Longman’s Milked, a tender and pertinent portrayal of rural life, unemployment, friendship and a cow called Sandy, is set to tour the UK from February. The play that earned emerging playwright Longman a Channel 4 bursary returns to the stage as Pentabus tour this comic and moving drama. First staged in 2013, the show will receive its London premiere at Soho Theatre and will be performed at a diverse range of audiences at theatres across the UK. Set in the heart of the countryside, the work tells the story of two men in their twenties – Paul, who can’t find a job, and Snowy, who can’t find himself. It is inspired, in part, by the playwright’s own experience of growing up in the countryside. The story explores the realities of life and opportunity for those at the beginning of adulthood, and the pressures facing young people living in rural communities. Writer Simon Longman, a graduate of the Royal Court Young Writers group, said: “Milked is a play about growing up in the countryside. “About not knowing what you’re meant to do despite doing everything that you’ve been told to do. “That moment where a young person’s life seems to become directionless, the moment when everything becomes very real, very quickly. Director Elizabeth Freestone said: “Simon’s writing is witty and humane, honest and playful. “Milked is a terrific new play about what it’s really like for the 20-something generation who are trying to carve out a future in places outside of big shiny cities. “Milked is urgent, relevant and very funny. Simon won a Channel 4 Bursary with this play and has spent the year with as us our writer-in-residence. Pentabus is a rural theatre company, which has produced 150 new plays over the last 40 years. Their mission is to develop and produce quality new theatre about the contemporary rural world, which resonate both locally and nationally. Their work has reached over half a million people across the nation. *Note: No cows are harmed during the staging of the production!